So you have a prohibition era 1920s event to dress up for and you don’t know what to wear? Here are 7 men’s 1920s costumes you can make from clothing you may already have or can attain from a thrift store, new clothing store or online retailer. How “easy” it will depend on what you can find and how much you want to spend. Unfortunately, there is not a single store that carries these looks as complete outfits, although Paul Fredrick comes close. We collected these costumes over a few years of looking, so don’t be dismayed if you can’t find the “perfect” look the first time out. For easy 1920s women’s costumes, look here. One of the easiest 1920s looks is a working class or casual men’s style. Poor or working class men couldn’t afford fancy three-piece suits, nor were they practical in labor intensive jobs. Men simply wore a pair of pants, suspenders, vest, shirt, shoes, and hat. Colors were a bit drab in brown, grey, and navy blue. Texture was a big thing in the 20s, so most materials was a rough wool or thick tweed. The fabric had a defined pattern, too, such as plaid, stripes, and herringbone. Next, add a coordinating vest. It doesn’t have to match, but it should be in the same color family. 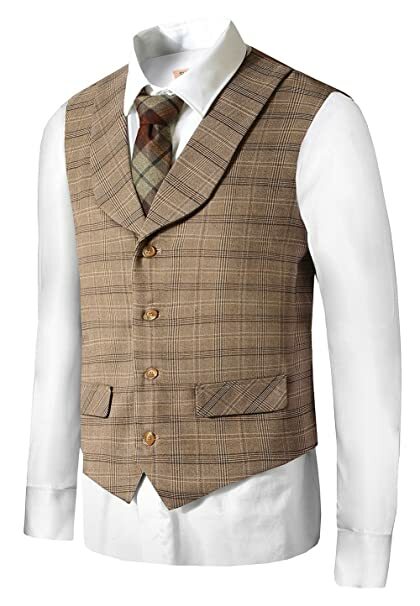 1920s vests had lapels and usually buttoned up high on the chest. Shop for 1920s style vests here. The shirt can be white or a striped, colored dress shirt with or without a collar. Any dress shirt you already have will work fine. Roll up the sleeves for that working class touch. A collarless or mandarin collar shirt will make you look like you couldn’t afford a detachable white collar and is also very period appropriate. If you want to wear a necktie go ahead. Working class ties were thin strips of fabric or hand knit ties. Both are popular styles right now, so they will be easy to shop for. 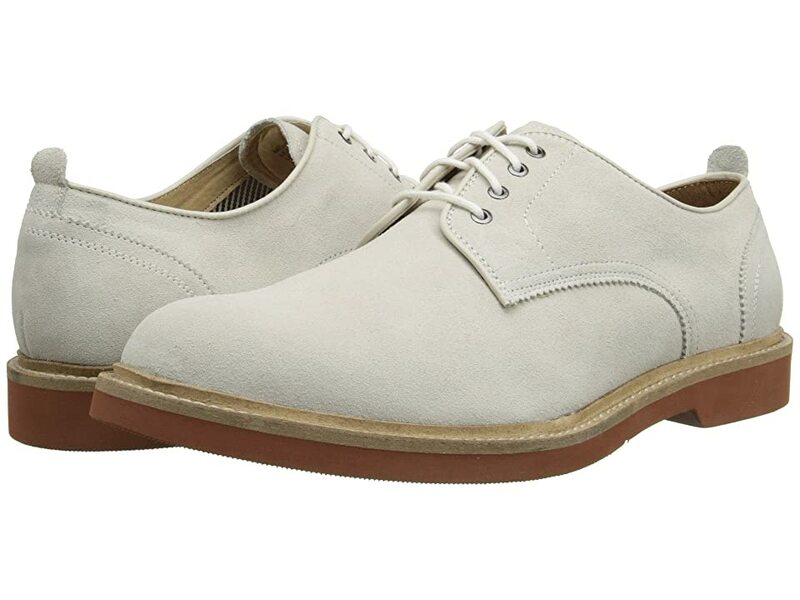 Your shoes should be basic, plain, lace up Oxfords in brown or black. Lace up boots would be OK too. A cap toe was the most common detail on shoes at the time. A working class man couldn’t afford fancier wingtips or two tone shoes. 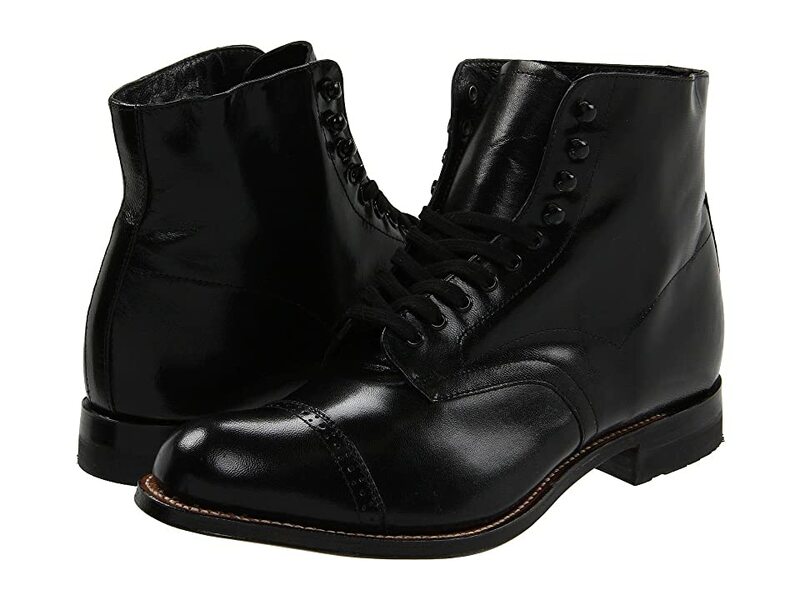 Buy 1920s style men’s shoes here. Learn about 1920s men’s shoe history here. The 1920s style cap is a must for your costume. The style at the time is what’s called an 8 panel cap or newsboy cap today. It’s not sleek and form-fitting like the ’30s styles, instead it is wide and floppy. Common fabrics were tweed, textured wool, felt, leather, and corduroy for winter, linen or cotton in summer. 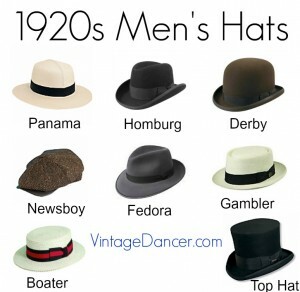 Buy 1920s style hats and caps here. Men’s Vintage Workwear– 1900-1940s- striped overalls, wool flannel shirt, denim jacket, cap, gloves and sturdy work boots. More vintage men’s workwear clothing history. A step above the working class man is the business class man. He is nicely dressed with an affordable suit that may be a few years old but not out of date. Art Deco Era Men’s Look- Fedora hat, plaid suit, two tone shoes. Suit: A matching 2 or 3 piece suit is ideal, but if you can’t get one, then choose at least pants and a jacket that are the same color. In this picture, the pants are flat fronts from the ’70s, and the jacket is a brown and white striped wool. Underneath is the same brown vest from the above costume. Ideally, a 1920s suit should button up higher but the striped jacket is an ideal ’20s pattern. New 1920s style suits here. Shirt: The shirt is a subtle striped dress shirt with a detachable white club (round) collar. A white shirt or solid pastel shirt would be fine, too, but stripes were the “in” thing to wear. An attached white collar shirt will be easier to find. A colored collar shirt is also OK for a late ’20s look. Learn about men’s shirts and where to buy detachable collars. Buy 1920s style shirts here. Tie: A necktie in paisley, small pattern or horizontal wide stripes are the semi formal tie option. A bow tie is also another fun and period-correct alternative. Wear a polka dot tie for something unique and very ’20s. Learn about and shop for men’s ties. Hat: Several kinds of hats can be worn by business class men. The Bowler or Derby (pictured) was a carry over from the previous decades. It’s most noteworthy fan was Charley Chaplin. Men also wore high crown fedoras, rolled edge Homburgs and straw hats like the Boater, Skimmer or Panama in the summer. Learn about men’s hat styles here. 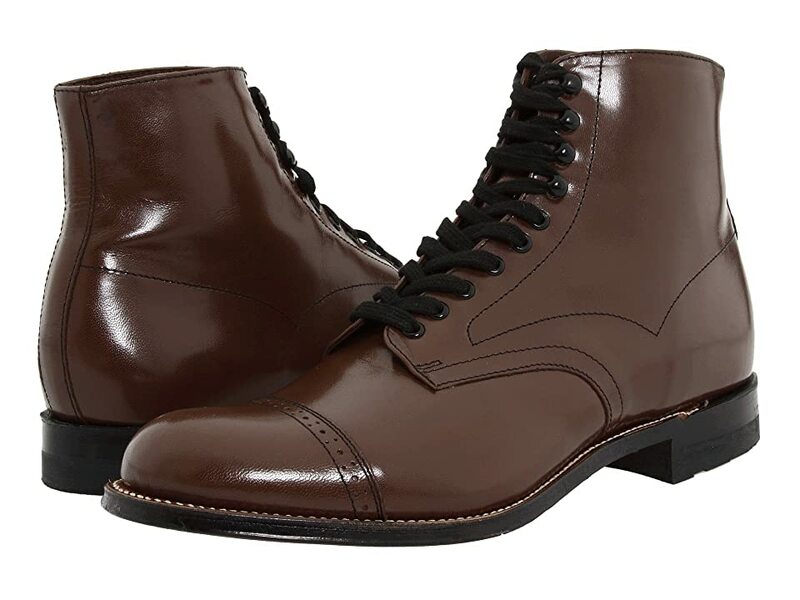 Shoes: A brown suits needs brown lace up Oxfords or boots. A grey or navy suit needs black oxfords. Cap toes or wingtips were a good men’s shoe. Learn about 1920s men’s shoe history. For a well-to-do man, like the Great Gatsby or Al Capone and his band of bootleggers, a complete head to toe look is important. They were the fashion leaders of the day. Suit: Striped or plaid suits in brighter colors started to appear around 1923-4. They can be a challenge to find today but are well worth it when you find one. We found ours at Dillard’s in the early summer made by Perry Ellis. It is a linen blue with white shadow stripes (wider than pinstripes). Stripes and plaid should be noticeable, not subtle. Single- or double-breasted styles are both common. Pants should be flat front, not pleated, and cuffed at the ankle. 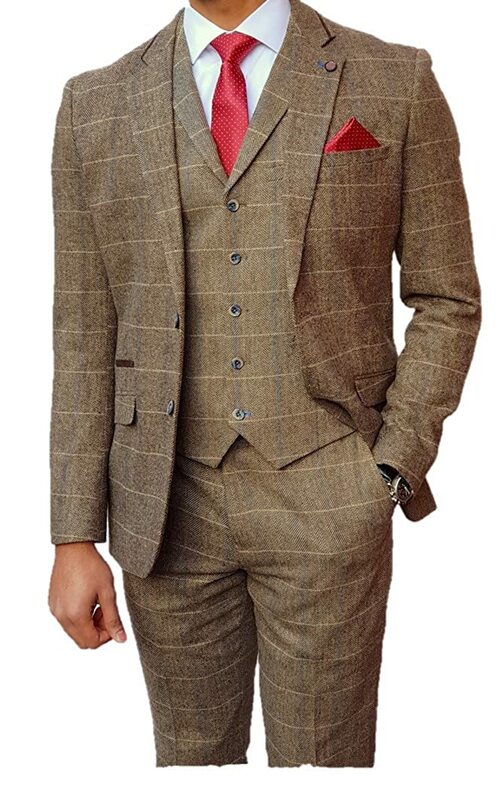 Buy new 1920s style suits here. Shirt and tie: Same as above costume. This time add a coordinating pocket square to the jacket (oops, we forgot to do this!). Another thing we could have added was a collar bar. Learn about shirts and collar bars here. Hat: Same as above. 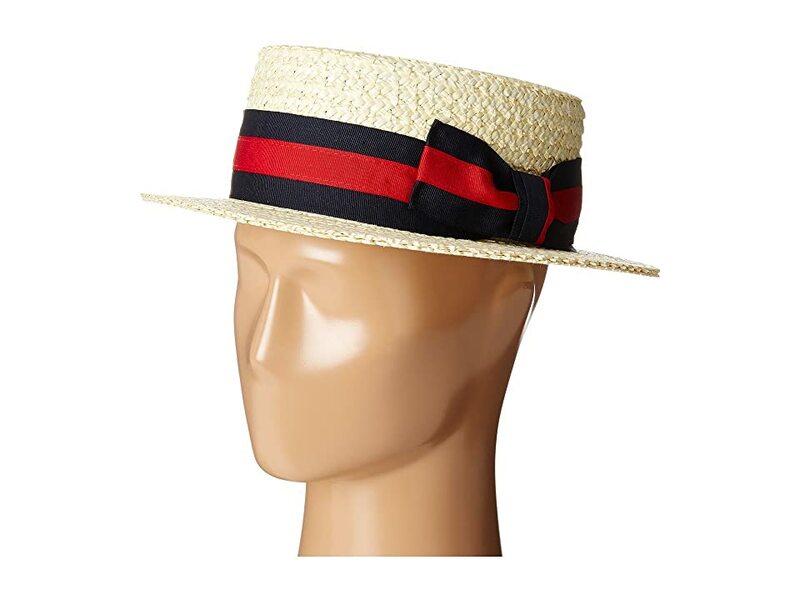 For this summer look we put on a straw boater hat, which was very popular for spring and summer. A straw Panama hat is another wealthy man’s summer hat. For a casual look, a white 8 panel cap would also look well. Shoes: Now you can bring out your two tone shoes. 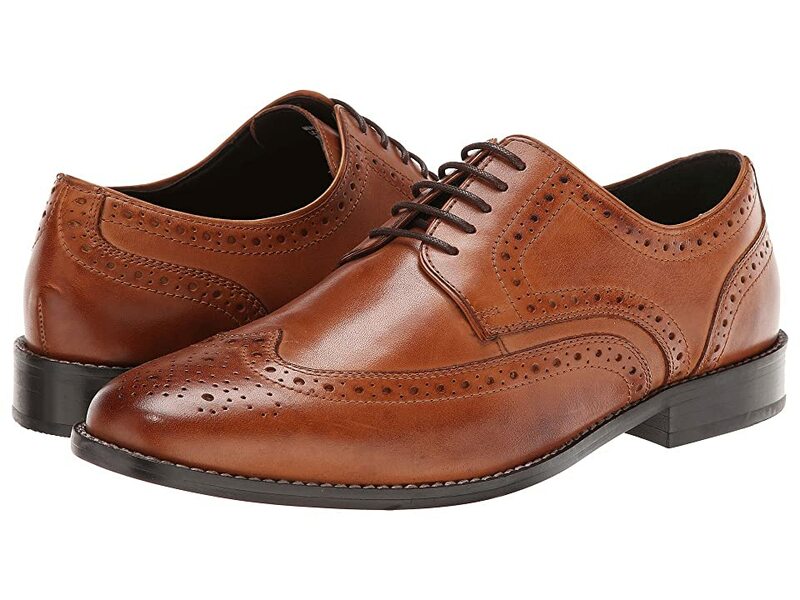 Wingtips, saddle shoes, or cap toes with brown and cream patterns. Black and white is less common. Otherwise, a solid pair of black or brown wingtips will look dapper when worn with a pair of white spats, too. Accessories: Gloves in a color to compliment, but not necessarily match, the suit is an appropriate addition. A pocket watch on a chain is another, although you won’t see it unless you take your jacket off. A walking cane is an upper class accessory that will set you apart from the business class men. Buy 1920s mens accessories here. In the summer, for upper class men, white was the color to be seen in. White or ivory was worn at garden parties, summer house parties and at outdoor sporting events. Suit: A white or ivory linen suit is nice and cool in summer. We found this white dinner jacket less prone to wrinkling than pure linen. A white dress shirt and summery gold tie complete this easy look on the left. Pink! Bright pastel colors were trendy in the ’20s. On the right we used a pink shirt and an “Art Deco” print grey tie. Pink was a bold new color that many trendy men were wearing (including the Great Gatsby). Hat: Again, straw hats are a must in spring and summer. Here we used our straw boater again. Good Panamas are quite expensive. We have gone through a few cheap ones fast. Don’t skimp if you can afford it. Shoes: White suits need white shoes. In the latest Great Gatsby movie, Gatsby wore grey and white two-tone shoes with his look. While I have never seen this option elsewhere, I believe it is period correct. Golf, tennis, hiking, hunting…. any kind of sport in the 1920s had its own fashion. In the 1920s, most sports and casual sporty outfits embraced cropped pants called plus fours. They are similar to knickers, except you don’t see the cuff band around the knee because the pant leg bags over it 4 inches (or more). While you can buy new golf knickers, it’s easy enough to make a pair. The simplest technique is to buy a pair of wide leg pants and either pin or sew in elastic to the cuff, then pull it up to your knee. For good sewers try this or this video tutorial. 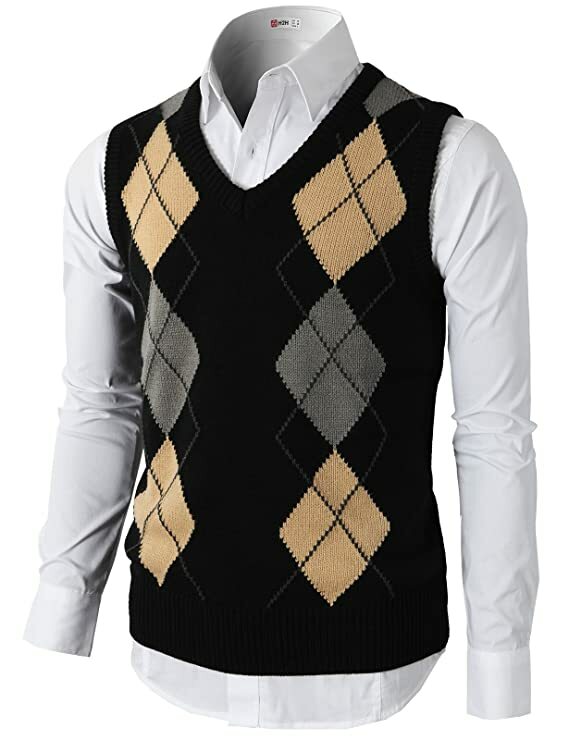 Next, add a pair of tall argyle socks (or any geometric pattern) and some two tone Oxfords. 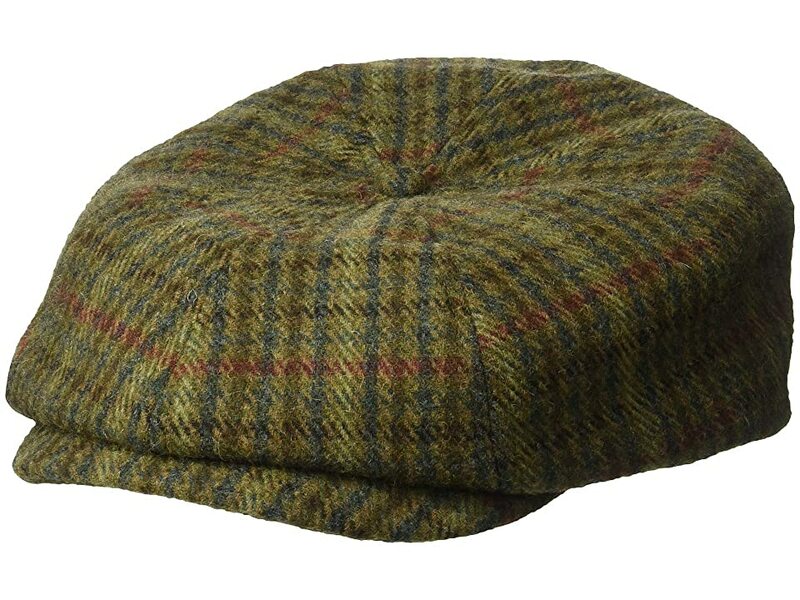 Bring back your newsboy cap from the working class look and you are now in the upper class golf league. This look also works for newsboys, teens and other casual men’s occupations or hobbies. For your top, you can wear a chunky cable knit sweater (pictured left/above) or a button up dress shirt and pullover vest with shirt and tie (pictured right). 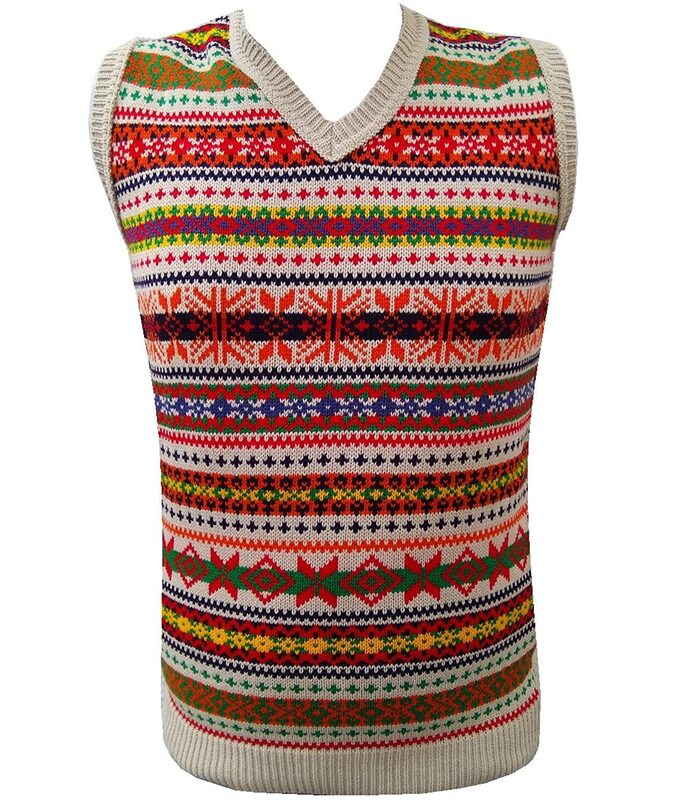 Vests were either solid colors or crazy patterns, like argyle and fair isle. The sporting look is one style that loved to combine mismatched patterns, colors and textures. Have fun, be wild and crazy and you will look the ’20s part. A look made popular by tennis stars was to wear white pants, shirt and pullover vest or sweater. Don’t forget to carry a vintage wood tennis racket to complete the look. 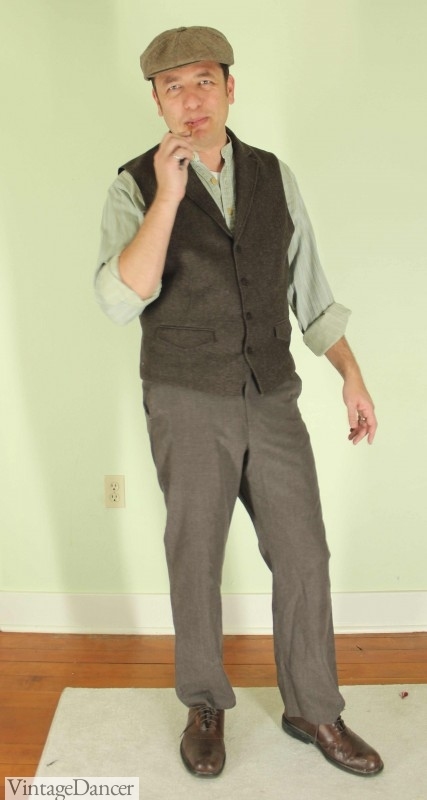 Casual 1920s look can be worn with or without a pullover vest. 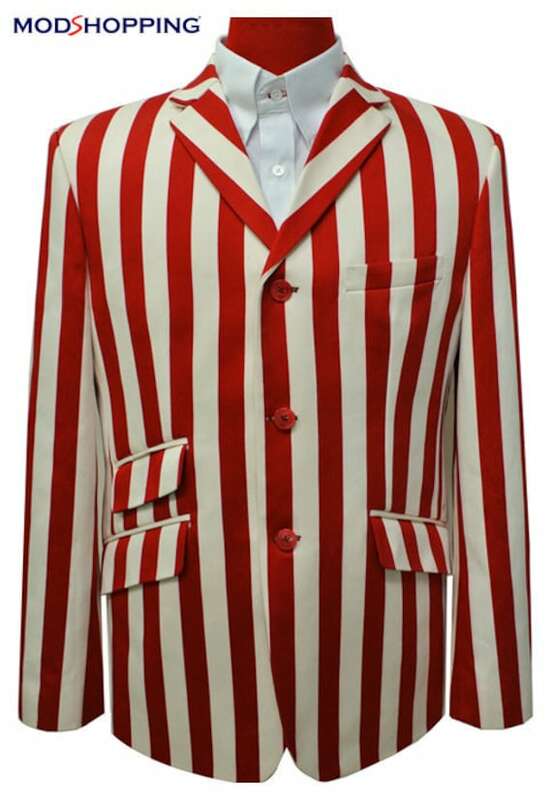 The seersucker striped suit goes back to the early 20th century but remained popular into the 1920s. The lightweight cotton seersucker material was perfect for summer suits. The small blue and white, grey and white, and even pink and white stripes fit right into the colorful patterns of most 1920s menswear. 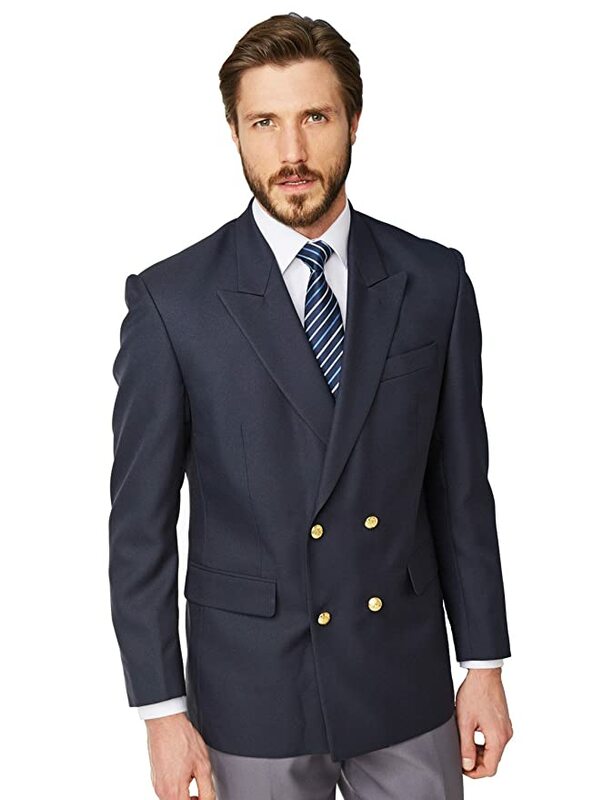 For our seersucker costume, we choose a double-breasted suit with matching vest from Paul Fredrick. A single-breasted suit would have also been perfect for this ’20s look. We added a pink shirt with white collar (a great combination!) and blue bow tie, two tone shoes, straw boater hat, white gloves, and a walking cane. Snazzy! A common alternative to a full striped suit is to wear a striped jacket/blazer over white pants. It was a signature yachting uniform and popular costume for barbershop quartets. For an after 6pm dinner party, evening at the opera or grooms wedding, dressing in men’s white tie suits was a requirement. Black tie was a semi formal look acceptable for immediate family dinners, and upper middle-class men. White tie means the vest and bow tie are also white. Black or white tie was also worn by waiters, bartenders, and nightclub party goers at upscale establishments. Another formal suit was the traditional morning suit. It was worn by upper class gentlemen and important chaps like Senators and prominent businessmen. It was also typical groom attire for 1920s weddings which took place in the morning or early afternoon. Men who had the budget to buy or borrow a morning suit would wear it on their wedding day along with groomsmen and fathers. What is a morning suit? A pair of high waisted grey and black narrow striped pants were worn with a white wingtip collar dress shirt, cravat tie and vest (grey or black), morning coat, white or grey gloves, white pocket square, black patent leather shoes, white spats (optional), black top hat and cane. It is a very regal outfit. It is not surprising that men are opting to wear this traditional wedding attire over a tuxedo again today. Learn more about men’s wedding attire here. That’s it! 7 “easy” 1920s costumes for men. Did I leave out a style you want to wear? Let me know in the comments or email me and I will help you put one together. Both occupations had men wearing nice suits. A lawyer was more well dressed and usually included nice jewelry such as a collar pin, pocket watch, pearl cufflinks, and maybe a club ring. A detective was less wealthy. He would have a good suit, shirt and tie. The movies always have them wearing a long coat too. What would you recommend for a Prohibition-era speakeasy costume? Some speakeays were expensive night clubs where everyone dressed in tuxedos. Others were hole in the wall rooms were everyone dressed in thier normal clothing (workwear, casual or business suits) so you have free range to choose whatever look you want. I would guess most men will dress in pants, shirt, with a vest or suspenders and a newsboy cap. It is an easy outfit, casual, and still very ’20s. 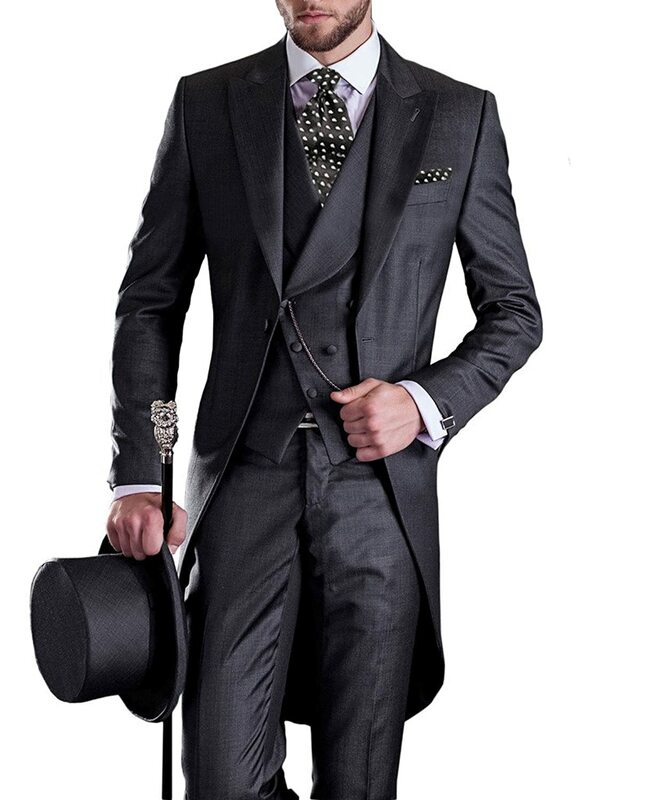 I want to purchase a Charlie Chaplin suit…. His look is more late teens to early 20s with what is called “morning suit.” Grey and black striped trousers, black tailcoat, white formal shirt, black derby or bower hat. Look here for some options: https://vintagedancer.com/1900s/edwardian-mens-suits-coats/ I will be writing a more indept article on Charlie Chaplin clothing soon. I don’t know of any online costume or suit rentals. About the only thing you can rent would be formal suits. As for big men’s suits each merchant has a different size range offered. If you need help finding a specif size or style please let me know. Hello. What is the brand and type of shirt that you have on in the photo discussing about pastel colors being popular. And the brand and type of tie you have on as well. The shirt is from J. Peterman with a detachable club collar from Premier Clothing and the tie is an art deco print tie we found in a thrift store. I am not sure of the brand or decade. This site is wonderful. I am planning a Great Gatsby themed wedding and not only have I scoured the whole thing for myself and my wedding party but I’ve sent every guest that has asked here. I have a question I’m hoping you can give me some guidance on. I have a 15 year old son. I want him to be dressed snizzily and as well as his sisters and the rest of the family, but I also want him to feel comfortable. Can you suggest what pieces will keep him out of a tux but not looking like the paper boy just snuck into the affair? How would your son like to dress more like a ’20s Gangster? Dark striped pants and matching vest, light dress shirts, tie or bow tie, and snazzy two tone shoes. 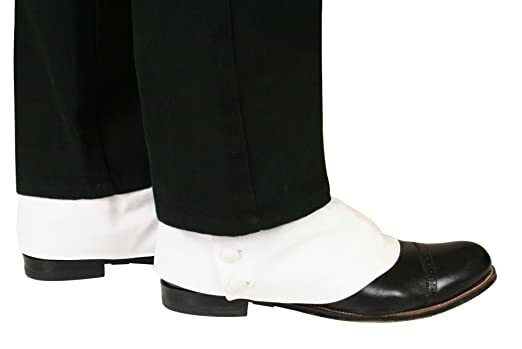 Or he could wear white spats over plain shoes. The lack of suit jacket will keep him more comfortable and the dark colors will make him more formal than a paperboy. Best wishes on your wedding. Send me pictures after. I would love to see how dapper everyone dressed.